Home › Latest News › Our Master Technician, Trevor, Takes The Trip Of A Lifetime! Our Master Technician, Trevor, Takes The Trip Of A Lifetime! An article by Master Technician, Trevor De Jager. 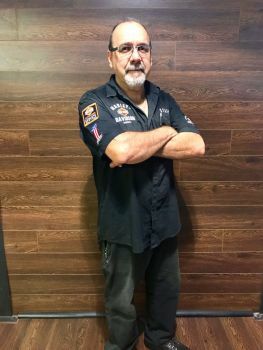 Trevor recently traveled to the Netherlands to further his education and skills as a Harley-Davidson® Master Technician and is now the highest qualified technician in the country! Below is a look into how Trevor’s trip went, through his eyes. “So my journey continues with Harley-Davidson®! The thought of traveling to a country with temperatures averaging from 2 degrees in the morning, to a mighty high of 8 degrees by midday, was definitely not exciting. However, the thought of gaining knowledge about the new technology (specifically around the introduction of the Milwaukee-Eight® engine), suddenly made the thought of those degrees trivial as excitement set in for what I was about to learn! It’s all about the bigger picture. My destination was a town called “Dordrecht”, in the countryside of the Netherlands, Holland. The friendly training staff of TTA made me feel very welcome. They introduced me to Jourie, the Dutch instructor, as well as my fellow trainee technicians from Siberian and Russian Dealerships. Needless to say, I was the only English-speaking technician about to learn some Russian! The course was for the Powertrain assembly which included both Twin Cam 88B engine and the brand new Milwaukee-Eight™ engine. Our objective was to strip and rebuild both engines, measuring different parts and using the correct methods and special Harley-Davidson® tools. It was very encouraging to see the huge changes in the design of the Milwaukee-Eight™ engine, especially after just completing the stripping and rebuild of the older Twin Cam 88B engine. The Harley-Davidson® Motor Company has really taken everything into consideration and have indeed listened to our customers in terms of what they have been asking for over the past few years. After 4 days of stripping and rebuilding engines (and a transmission box), I spent my last day back at the training centre, but this time as a helper/ trainer/ advisor, on a one day course with a new group of Russian Technicians. It gave me more time to explore and watch the new Milwaukee-Eight™ being disassembled and re-assembled once again, this time by some-one else. It was my turn to help train, give advice and teach the right methods! All in all, my trip and training was an uplifting experience, revitalizing my already-great passion for the Harley-Davidson® brand.